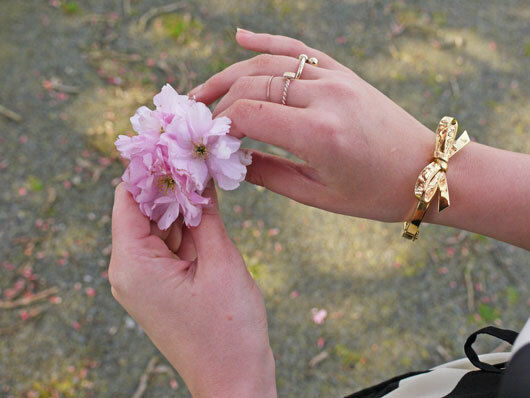 Cherry blossoms are a favourite among the blogging community.. This time of year you see blogs and instagrams dotted with shots of feet surrounded by petals, buds of flowers held in palms of hands, and shots like this one above- My attempt with the pink trees as a perfect summery colourful backdrop. They just make any photograph look better in my opinion and with this amazing big tree just next door to my new home I had to make the most of it here and already on my instagram feed. Ive always seen myself as more of polka dots than stripes girl but I LOVE this dress. I got it last year in H&M a random one off just hiding on a rail waiting for me to find it, at a steal of 14.99 (i think) I got my wear out of it last year & will be wearing it again lots this summer, weather permitting that is! Its made of this amazing parachutey (not even a word but lets go with it) material that is breathable in hot weather but hangs really well and holds this perfect fluted shape. Dress: H&M, Sandals: New Look, Gold Bow bracelet: Kate Spade, Rose gold square ring: Whistles, Thin gold band: H&M. Glasses: Gok Wan. You are so gorgeous, Vicki! Even the cherry blossoms can't compete. It looks like the weather is shaping up for your big day, too! BEAUTIFUL dress and photos! "Parachutey" is definitely a word. I love the photos. i wish I was a bit braver and would take some photos outside. 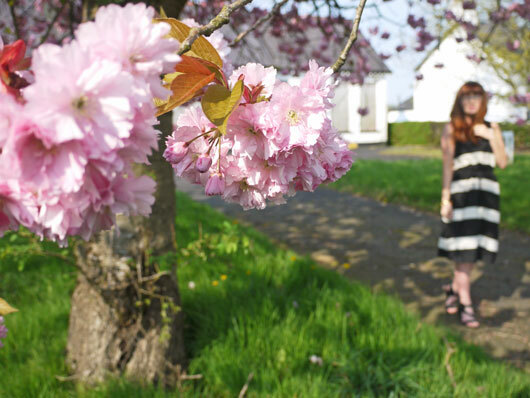 Gorgeous photos, you cant go wrong with Cherry Blossom its just so beautiful. aww I love all these pictures, the scenery is gorgeous and you look fabulous! What a beautiful set of photos, you look stunning here!